i-ask! | Have a question? 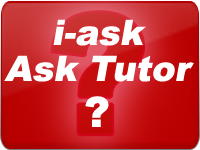 Ask Tutor! ACCA LIVE is here on Pakaccountants! i-ask! is one of the great service that was started by ACCA LIVE and soon became one of the most favorite among accountancy students especially CAT and ACCA. We already have hundreds of websites answering accountancy related questions but most of the website are answering questions in general and not specific to any qualification. Therefore, the faculty of ACCA LIVE came up with an idea to answer questions in context of qualification student studying and provide answers from syllabus and examination point of view instead of giving some general answer. Now as this facility is also available on Pakaccountants you can also ask questions directly from tutors. But don’t forget you can also discuss your questions in our forums. You can ask your question by filling in the following form and your question will be answered on our website if you like.